It’s the most wonderful time of the year, and unfortunately, also the most wasteful time of the year. 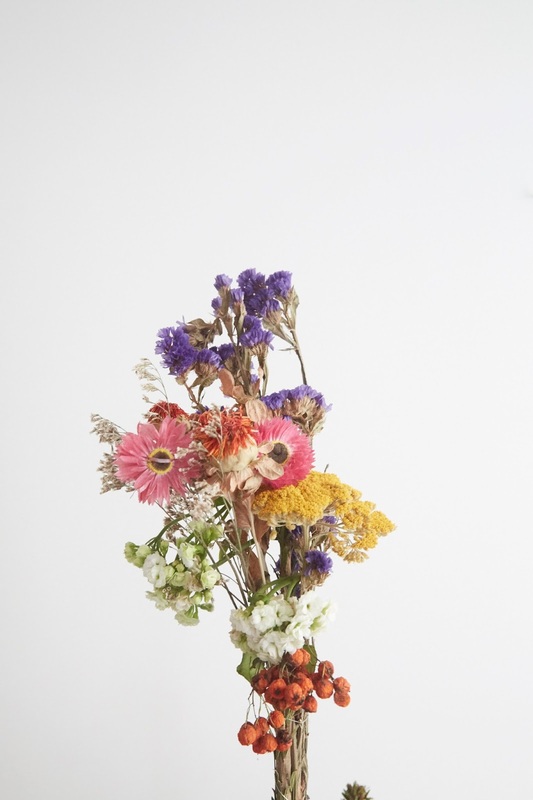 With much of our most loved traditions causing harm to both the planet and its inhabitants, there are some easy and effective ways to adjust ones doings and buyings to embody a more earth loving and ethically sound state of being. It's estimated that every Christmas tree bought in the UK this year put end to end, would be the equivalent of a return trip to New York City, indicating it is high time we come up with some sustainable adjustments to adhere to if this Christmas is going to be a conscious one. Real Christmas Trees are greener (literally and figuratively) than artificial ones, so much so that this life cycle assessment (via the Note Passer) found that you would need to use an artificial tree for at least 20 years to equal the footprint of a real tree used once. Wasting less is actually quite easy in some cities. In London, for example, you can order a living tree, decorate it and spend Christmas with it ... and then have it picked up and either recycled or replanted when you’re through. Even if you haven't' got a replanting program in your city, there are still plenty of sustainable options available. Switching to a sustainably raised organic tree (most farmer’s markets have them) and recycling it post-Christmas with your city’s recycling program is also very green. Alternatively, there are some creative and aesthetic options, like THIS reusable ReTree which is handcrafted out of sustainably forested wood in San Francisco, or THIS cardboard tree DIY, or this Christmas cactus, or this chalkboard tree, or even this DIY branch tree. 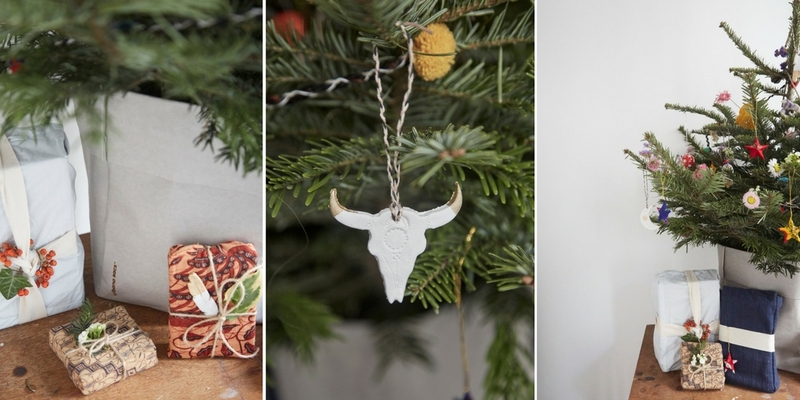 When it comes to decorating the tree, a healthy collection of handmade and thoughtfully collected ornaments is the best bet. Ideally, those ornaments will be ethically made (the boxes of crap ornaments you get at your local department store are priced so cheaply because those who created them were paid unfairly), and you'd get eco-bonus points if you can decorate your house with them in the non-holiday season as well ... utilizing fashion’s #30Wears movement in ornament format. As my husfriend and I only owned one ornament between us ... and the dried fruit ornaments I made last year met an untimely demise when a leak in our roof sprouted mould on all closeted things, we opted for a more traditional approach this year. Since I was a child, each Christmas my mum would drive my sisters and I out to TEN THOUSAND VILLAGES to buy gifts for our extended family. She would let us choose one new ornament to share between us, keeping us busy with egghunt-esque energy while she shopped. Back then, I had no notion of the story behind the individual products, I just loved being in that store. It didn’t have aisles and unlike most stores of its size, everything was displayed on low tables and unpackaged so you could see it all at once in the most aesthetic and awestriking displays. Each item seemed special, detailed with admirable artistry, tactile, unique and beautiful. It marked me with such positivity that I still hold a sense memory of appreciation for the experience. It always seemed like a magical place. This Fall in preparation for the creation of this piece I contacted TEN THOUSAND VILLAGES and asked if they’d like to work with me. They generously agreed, and as I clicked through the site, reading the description of each artisan group, that childhood feeling came back to me, but in a different way. This time I got lost in the stories, like one behind the beautiful capiz ornaments they carry which are made from the shell of a marine mollusk. First artisans wash and soak shells, then once dry, cut, dye and edge the creation with metal wire. 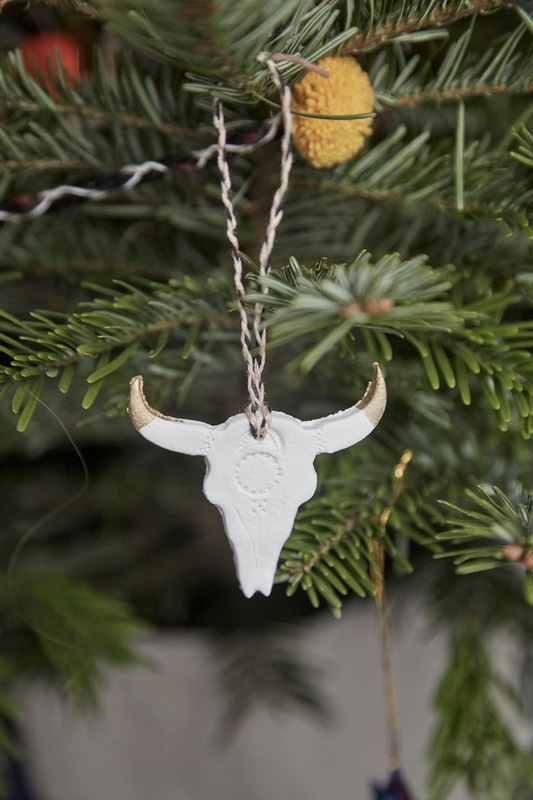 I fell too for the artisan group who created recycled sari stars I decorated my tree with and the ancient artisan craft of brass bell making which created the beautiful brass bell garland that features the same bells used to adorn horses in India. 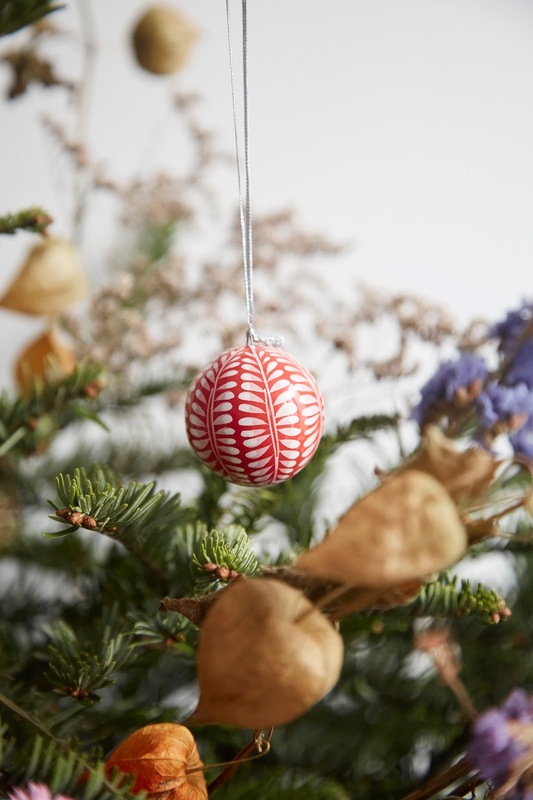 I was inspired by the hand-painted ceramic ornaments created by Vietnamese artisans under the protection of Craft Link, a nonprofit organization, which focuses on providing work for ethnic minorities, street children and artisans with disabilities. Each piece I selected, and that they carry for that matter, aligned with the spirit of the season and the morals and ideals I've come to covet inside of me. 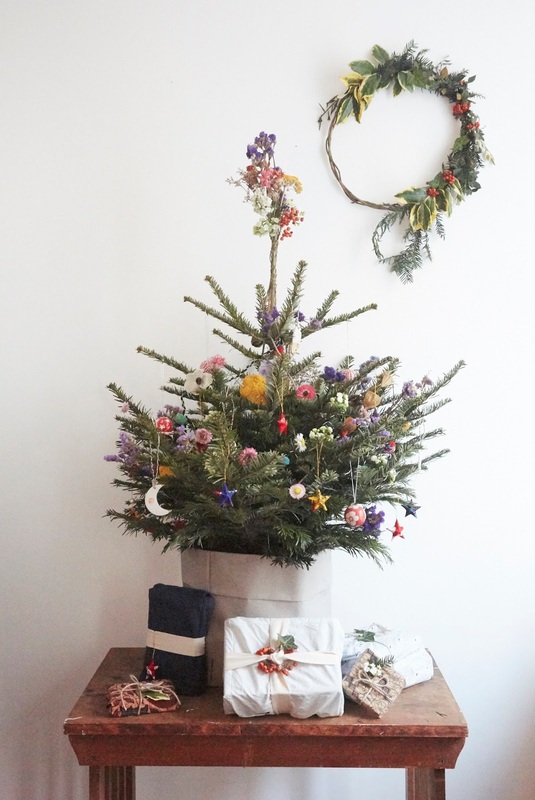 For our tree, I paired my beautifully created, plastic and packaging free TEN THOUSAND VILLAGES ornaments with dried flowers from a bouquet we bought in Rennes, France. 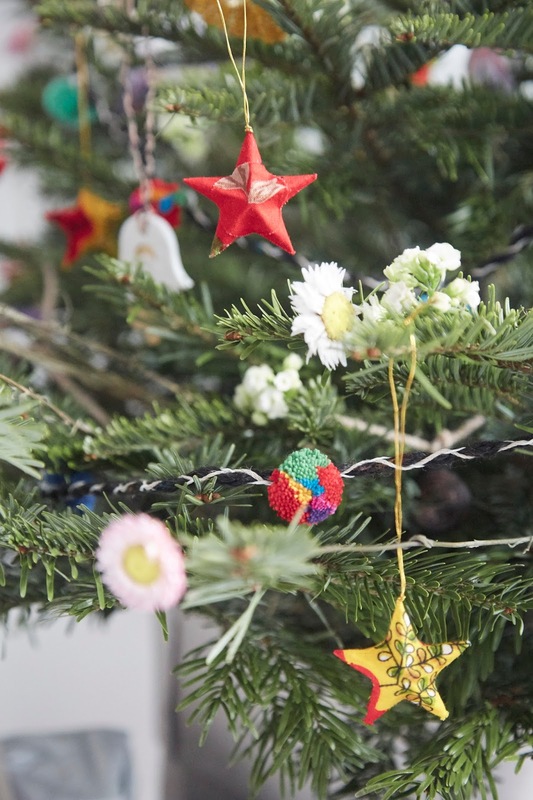 Then I added in a few handmade clay (I’ll share the DIY later this week) ornaments, a handmade pom pom garland (this DIY is coming soon too) and topped the tree by wrapping a wire around some of the flowers, all of which I’ll return to their original bouquet post-Xmas. We had originally planned to use a houseplant we had for our Xmas tree, but when the heat was turned on in our building while we were away, the poor plant got friend (bad plant parents, I know), so we opted for an Organic Living Tree from our neighbourhood market and housed it in my XL Urbana Sac which I normally use as a laundry hamper, but acts as a perfect base for the tree. Made out of recycled saris by a fair trade artisan group in India, these Recycled Sari Stars are individually unique. 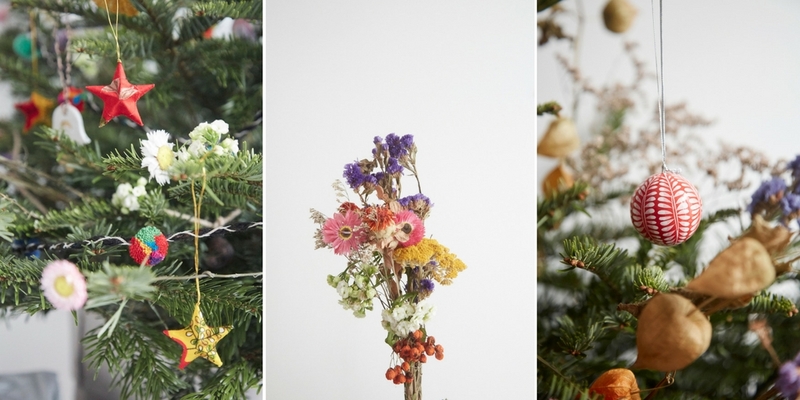 They offer a colourful pop to the Holiday Tree and make a sweet decorative garland for the home in the non-holiday season. I’ll post the DIY for these ornaments later this week, SUBSCRIBE to my Youtube Channel for a notification when the ‘A Very Conscious #Vlogmas’ story is up! Made with a special blend of virgin pulp fibre and recycled felt which is manufactured through cultivation, not deforestation, these sacs are so flexible you can get them wet and reshape them like clay to your needs, giving them diverse use in your home. Artisan created brass bells by fair trade cooperative called Noah’s Ark that protects ancient artisan crafts. These bells are completely diverse and I’ve already used them for decorating our Thanksgiving table. During the non-holiday season, they’re strung above the bed, creating a sweet decoration for us year round. I’ll post the DIY for the pompom garland in the next few weeks, SUBSCRIBE to my Youtube Channel for a notification when the ‘A Very Conscious #Vlogmas’ story is up! Created by Vietnamese artisans under the protection of Craft Link, a nonprofit organization, which focuses on providing work for ethnic minorities, street children and artisans with disabilities. 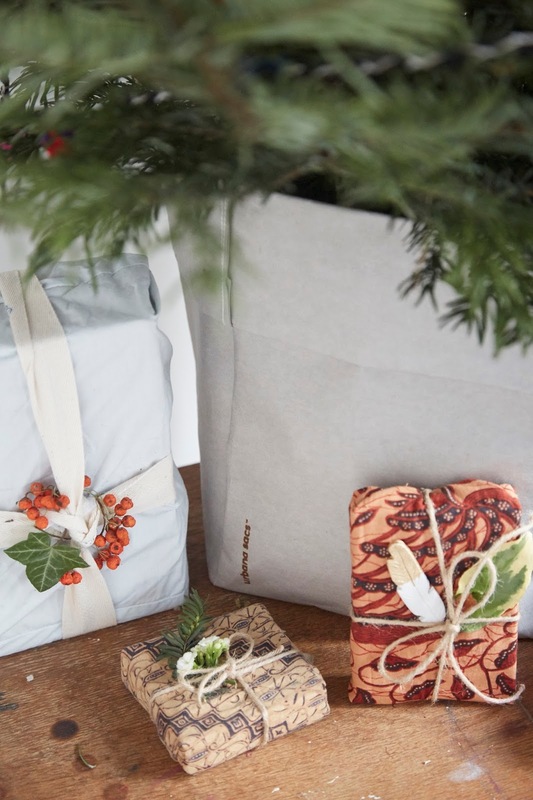 SPONSORED POST: This post was sponsored by Urbana Sacs & Ten Thousand Villages, the story, items pictured and their use are, as always, my own. I love this post and your tree is beautiful! We actually did inherit a very large, very old artificial tree from my in-laws, and have spent many hours decorating it each Christmas. It must be close to 30 years old at this point. 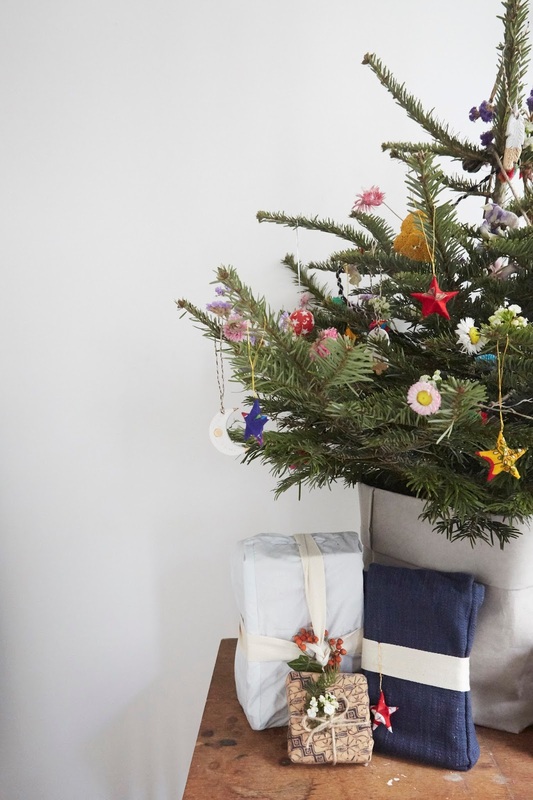 I switched to a smaller tree in recent years because it's so much easier (the old tree is in the attic), but I'd love to use this idea next year. I'm really trying to do smaller Christmases each year, so my boys can see that it's about so much more than gifts. Replanting a Christmas tree, eh? I didn't even know that was possible!